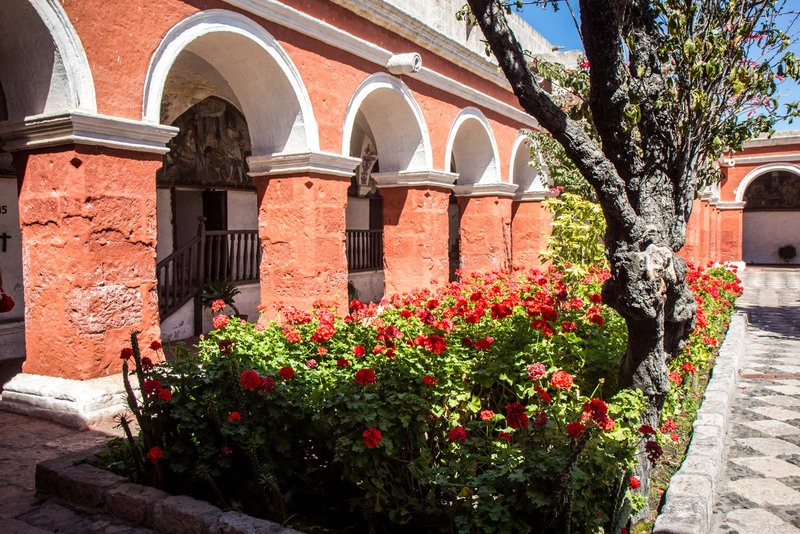 The story of the Santa Catalina Monastery in Arequipa has always been about money. So much for a vow of poverty. 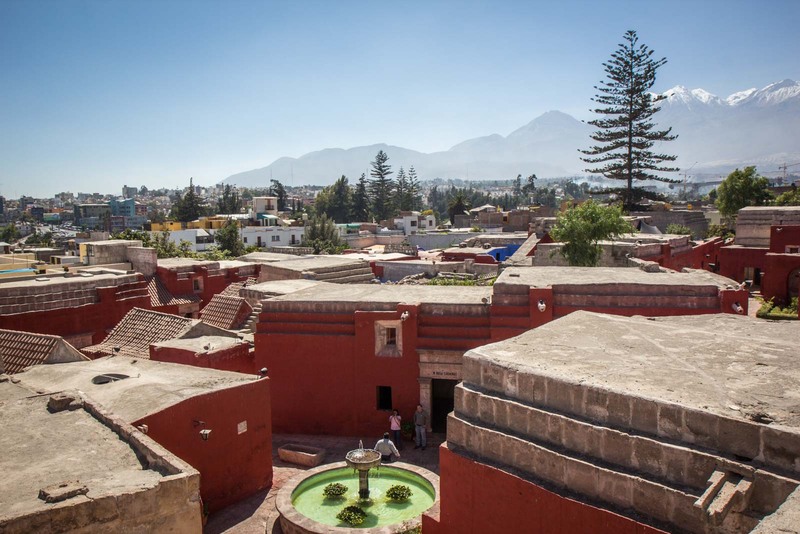 The founders of Arequipa decided to establish a monastery early in the history of the city, in the 16th century. They set aside some land and construction began. But before it was even finished, a wealthy young widow called Doña María de Guzmán decided she wanted to retire from public life and join the monastery. She became the first resident and brought with her a lot of money. This bought her the position of prioress and founder and, with all that cash, set about expanding the plans. 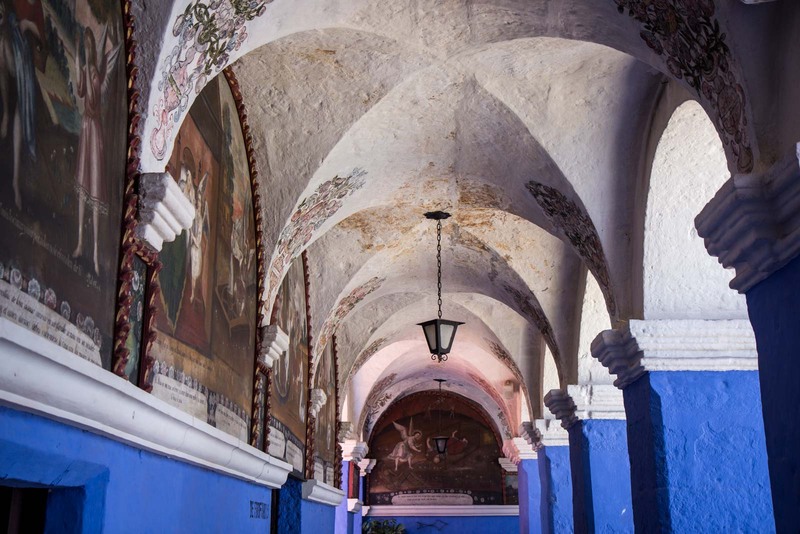 The Santa Catalina Monastery was officially founded in 1580 and, quite quickly, it began to attract women of wealth or from important Spanish families. This is probably understandable, considering it was effectively founded by a woman of both wealth and social stature. Many of these new nuns didn’t want to give up their luxurious lives, though. They bought with them their servants and household goods. Luxurious carpets, English china, silk curtains, paintings, lamps – these things all adorned the rooms of the women who had ostensibly come to dedicate their lives to God. The families of these women also had to pay a dowry for them to be accepted – an amount that would be worth about US$150,000 today. And so it continued like this for several centuries. When earthquakes damage the building, the families of the women paid for the repair work. The compound was expanded and single rooms were built for some of the nuns when the dormitory areas began to get too full. It wasn’t until 1871 that the then pope, Pius IX, sent a strict Dominican nun to the monastery to makes things a bit more, well, pious. He had heard tales of what was happening at Santa Catalina, which had turned into more of a social club for the women than a place of religious devotion. Apparently musical bands were being brought in to perform at parties, for instance. This new head nun sent the rich women back to Europe and freed their servants and slaves, who were given the option of remaining as nuns. Major reforms took place and the monastery finally became a symbol of the vows that were supposed to define it. 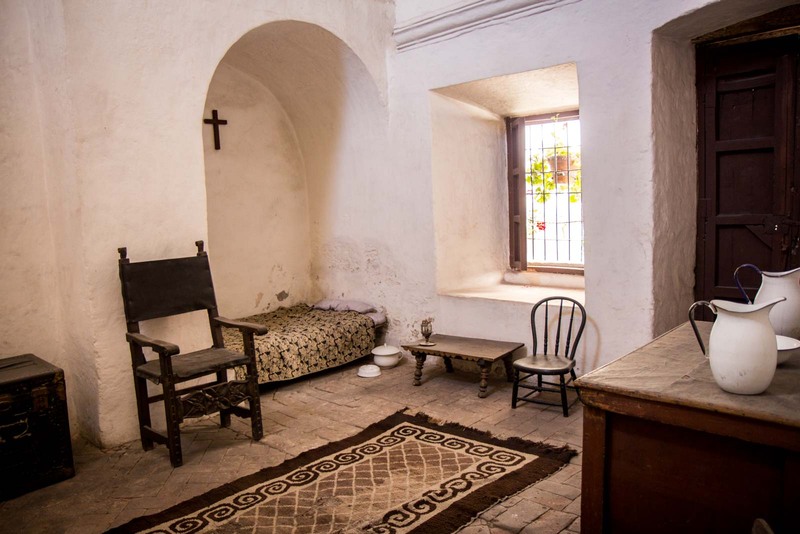 At the height of the history of Santa Catalina Monastery, more than 450 people lived within its walls. 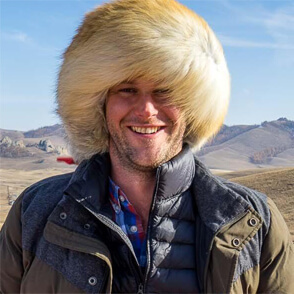 Now, though, there are less than 20. As the cash from the rich European families dried up, so did the ability to maintain the complex. 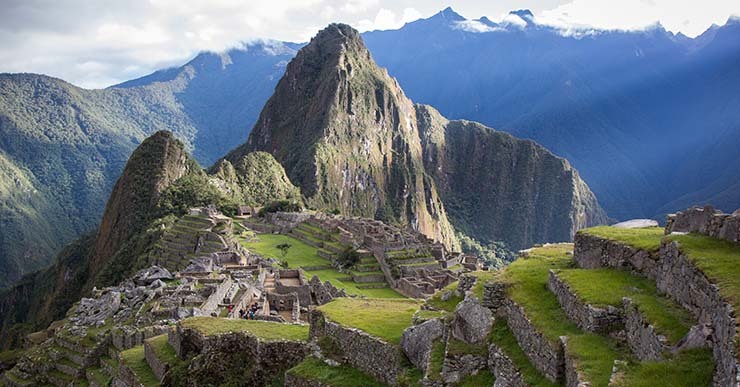 Some of the structures were severely damaged by earthquakes and, until the 1970s, had no electricity or running water. Money was again influencing the future of the monastery – just in a very different way to centuries earlier. Eventually, with very little funding, the decision was made to open the monastery to the public and turn it into a tourist attraction. The remaining dozen or so nuns retreated to a small area within the compound and the rest became a museum. With the expansion over the years, the monastery feels like a city within a city. It is enormous and takes a couple of hours to walk through and explore properly. There are proper streets criss-crossing the site between buildings, leading to cloisters, chapels, residences, halls and kitchens – all stretching out across an area about two hectares in size. Through it all are beautiful paintings, European-styled streets, flowers, gardens and peaceful areas for quiet reflection. Many of the buildings were constructed with a volcanic stone called sillar with carvings and decorative features. Although heavily-influenced by Spanish styles, the design is fused with indigenous elements, giving the whole complex a unique colonial feel. The tall stone walls around the monastery had long kept out the curious – firstly those who were perhaps envious of the luxury and then those who didn’t understand the poverty. 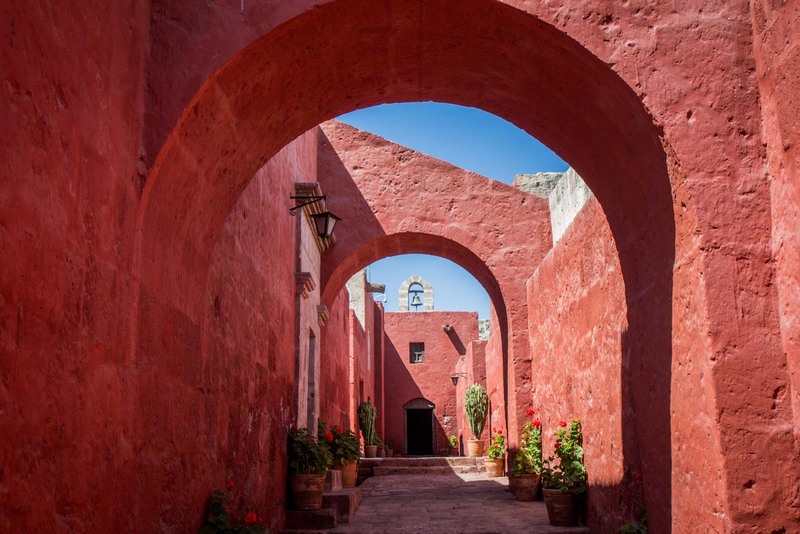 Now, though, visiting Santa Catalina is a highlight of a trip to Arequipa. 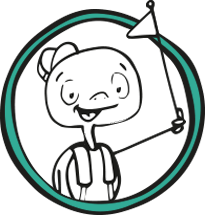 Or learn a bit more about the city and explore it yourself. Either way, don’t miss it! Oh this sounds like a wonderful place to visit! If I was going to live like a nun… well parties with live music would be a good way to go about it 😉 Thanks for sharing. Arequipa was our favourite city in Peru! Hi Michael, we are from Sydney and were there today as well. What a small world sometimes. It was interesting to me to see how they eventually all shared a common sleeping area and thinking it must have been quite a shock after having private bedrooms (with servants). I look forward to your future articles! These pictures are absolutely wonderful, they really draw you in and make you feel like you’re there in the buildings too. And what a fascinating story. The idea of having to pay $150,000 to get into a supposedly pious and devout monastery just kind of boggles the mind! I wonder what they got up to at those parties…?